Ottoville’s Haley Hoersten (15) and Nicole Knippen go up for a rebound during Saturday night’s Putnam County League game against Leipsic at Ottoville. 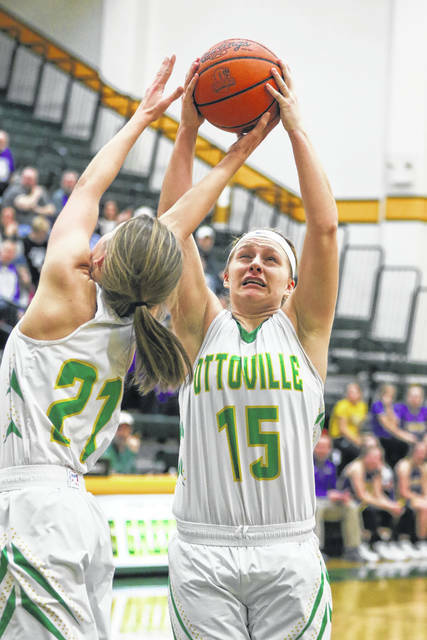 Ottoville’s Brynlee Hanneman goes for a shot against Leipsic’s Liz Scheckelhoff during Saturday night’s Putnam County League game against Leipsic at Ottoville. Leipsic’s Claire Rigel, right, breaks up a pass intended for Ottoville’s Kylee Hoersten during Saturday night’s Putnam County League game against Leipsic at Ottoville. OTTOVILLE – Ottoville ran through its senior night festivities with plenty of hugs and hoopla. Then, for the first quarter the Big Green struggled to get back to basketball. 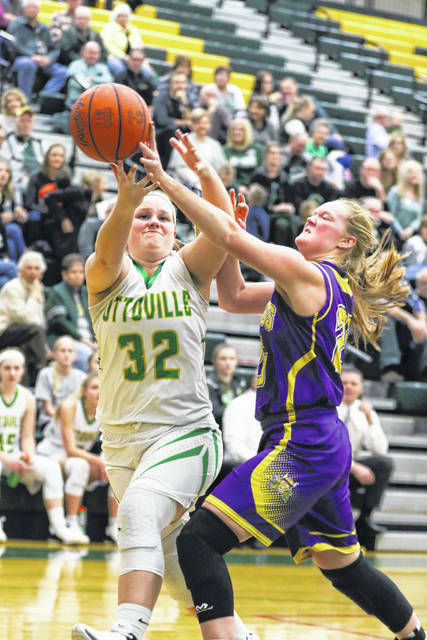 Ottoville’s Quinley Schlagbaum pulled the team back on track with three 3-pointers in the second quarter and Ottoville ran past Leipsic 54-20 in girls basketball Saturday at Ottoville. Ottoville outscored Leipsic 19-2 in the second quarter to erase a first-quarter deficit and pulled out to a 24-9 lead at the half. The senior Schlagbaum, one of four seniors who were honored, scored 11 points in the key second quarter. Schlagbaum finished with 13 points and three 3-pointers. Sophomore Nicole Knippen led the Big Green with 16 points, six rebounds and three 3-pointers. Kasey Knippen had seven points and seven rebounds. Brynlee Hanneman had seven points. Ottoville is 17-2, 6-1 in the Putnam County League. The Big Green are in second place in the PCL behind Kalida (4-0 PCL). Leipsic is 12-6, 3-2 in the PCL. Claire Rigel led the Vikings with six points and 10 rebounds. Liz Scheckelhoff had six points and six rebounds. Ottoville’s shooting couldn’t have been much worse in the first quarter. The Big Green hit 2 of 16 from the field in the opening quarter against the Vikings’ 2-3 and 3-2 zones. That helped Leipsic take a 7-5 lead after the first quarter. Schlagbaum ignited the Big Green in the second quarter with back-to-back 3-pointers. Added Kleman, “We’ve been after Quinley (Schlagbaum) to shoot the ball more anyway and she did. She hit three threes tonight. She’s more than capable. Then, Nicole Knippen sank a 3-pointer in the second quarter. That helped Ottoville rip off an 11-0 spurt to pull out to a 16-7 lead with 5:35 left before halftime. 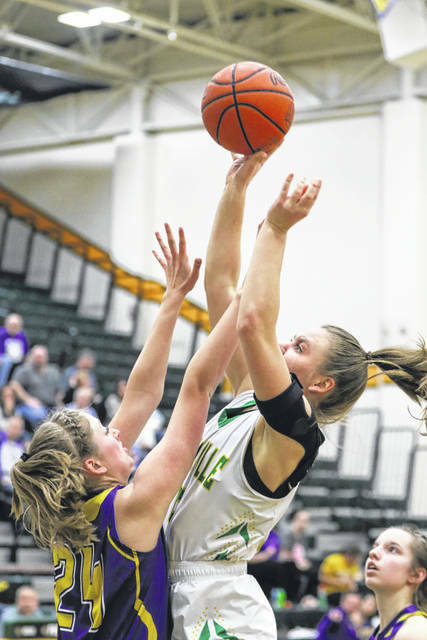 “(Kasey) Knippen was out of the game then with two fouls and we knew Schlagbaum was their next best shooter, and we lost track of her and that really hurt us,” Leipsic coach Gary Kreinbrink said. Schlagbaum’s third 3-pointer of the quarter gave the Big Green a 19-9 lead. The Big Green led 24-9 at the half. The Ottoville 1-2-2 press and its man-to-man forced Leipsic into 19 turnovers, including 12 in the first half. Ottoville won the boards 35-28, and 20-8 at the offensive end. Nicole Knippen powered the Big Green in the third quarter with 10 of her 16 points in the third, including two 3-pointers. That pushed the Big Green lead to 40-18 after three. Ottoville shot 37 percent from the field and was 8 of 23 on 3-pointers. Leipsic shot 37 percent from the field and was 2 of 9 on threes. The Vikings managed just two points in the second quarter and only two points in the final quarter. This entry was tagged leipsic, ottoville. Bookmark the permalink.